Reduce Driving Lesson Cancellations – Top Tips! 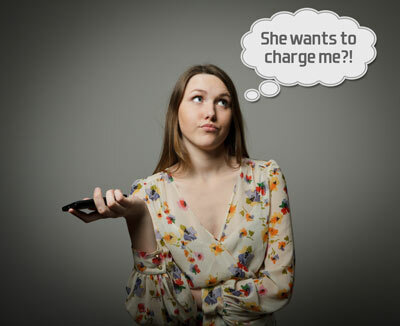 In our experience, this is the number one way to reduce your cancellation rate. Don’t take it for granted that pupils will understand the ins and outs of self-employment, because the vast majority won’t. 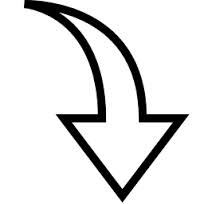 For those of you that are franchisees, many learner drivers will incorrectly believe that you are paid a wage by the company named on your roof sign, so when they cancel, they’re actually not affecting you at all – as far as they’re concerned, the ‘company’ just loses out. For most people (and especially teenagers), this will be the first time that they will be held financially accountable for cancelling an appointment of any kind. Try to think from your pupil’s perspective – they don’t have to pay when cancelling their dentist, doctor or hairdressing appointment! So why does their driving instructor want paying for a lesson they haven’t provided?! Don’t expect them to be psychic or to just read the fine print about cancellations on your website or on the back of their appointment card. Whether you work for yourself or on a franchise, take a few minutes to candidly explain how important it is that they give you plenty of notice if they need to cancel. Don’t put it across in a threatening way – just explain in an honest and friendly tone how it affects you and your business if they cancel at late notice. At the same time, make your commitment to them – that if you ever need to change their lesson date or time, that you will compensate them too. This builds trust and shows your integrity – they are much more likely to respect you for it. Outline the conditions for cancellation (see below) and end the conversation by simply asking for their verbal understanding, “so are we OK with that, or do you need me to clarify anything?” Ignore this first tip at your peril – if you decide not to heed this advice, don’t be shocked when a pupil who’s called a few hours before their lesson to cancel gets a bit shirty when you tell them they’ll have to pay for it! Having clear terms and conditions is a must if you want to enforce payments for cancellations. Terms and conditions need to be fair and work both ways. If your customer cancels and is held financially accountable, surely it’s only right that you offer some form of compensation if you cancel, too? 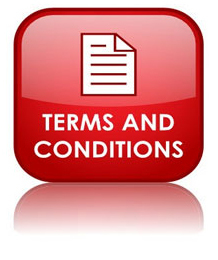 Make your terms and conditions easily available, have them on your website and appointment cards. Go through cancellation policies at the time of booking and/or on the first lesson. Even so, it can be hard to enforce and if reliable customers have a genuine reason for cancelling, waiving the cancellation on that occasion can make good business sense. You don’t want to lose an otherwise reliable customer all because you charged her for a lesson when she was in hospital with her son. Tip 3 – Don’t GIVE them the excuse! I remember meeting an ADI for some skills development training a few years ago. He was really down-in-the-dumps about his cancellation rate, which in that particular week was over 50%! I asked him about his terms and conditions, how he explained them to his pupils, and how strictly he enforced them. His reply went something like this: “Yes Ged, I tell them that they have to give me 48 hours’ notice of any cancellations, otherwise I’ll charge them. But obviously if they’re ill, I don’t want their germs, so it’s fine to cancel then” When I asked him what the pupils’ reasons for cancelling that week was, can you guess what his reply was? 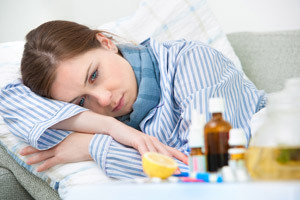 Yes, you got it – “they’re all ill”. Hardly surprising, was it? 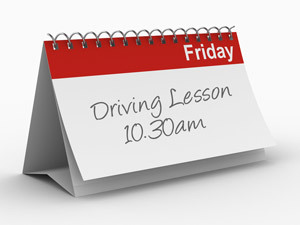 It’s a good idea to waive the lesson fee if your pupil is genuinely poorly, but don’t tell them in advance that this will be the case, or else the same excuse will be used every time they just can’t be bothered with their driving lesson! Where possible, keeping the same time and day for pupils can help reduce the likelihood of them cancelling. Having the same time allows the customer to plan the rest of their week around this regular commitment. When lessons are moved around a lot it’s easy for the pupil to ‘forget’ when their lesson was or double book that lesson time with some other commitment. Also, bear in mind that if you keep changing their lesson time around from week to week, they’ll expect you to allow them to do the same. Having said that, do bear in mind that learners will benefit from experiencing driving at different times of day, so moving a lesson time to another ‘regular slot’ for a few weeks should work well. This is one that I feel is extremely important. I like to treat others the way I want to be treated. So if you want your customers to be reliable, you need to lead by example. It may suit you to ask that customer if they can do their lesson earlier (because someone else has cancelled) or if they can do a different day (because you don’t want to go out for just their lesson that afternoon) but be warned! If you think it’s acceptable to expect them to regularly change their plans for you, they will the same in return! When Claire worked as an independent ADI, she asked for payment in advance. 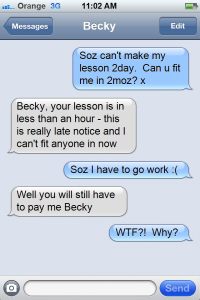 On the first lesson, she charged for 2 lessons. This never caused a problem and she always made her cancellation policy clear. If she had a cancellation, it was already paid for and they would need to bring payment for 2 lessons next time to be in advance again. If you’re on a franchise, you may be restricted by the policies of your franchise agreement, but if you’re independent this is a good way to reduce cancellations AND be paid for the cancellations that you do get. Claire noticed a big drop in cancellation rates when she started implementing this method. Great tip on how to reduce driving lesson cancellations and not lose money or a client. It’s much easier to charge for cancellations when you have the money up front. Block booking discounts offer an incentive for customers to pay for 10 hours at a time, but is your incentive enough? We noticed a big difference in the amount of pre-payments for blocks of 10 hours when we put our hourly rate up but kept the block booking the same. 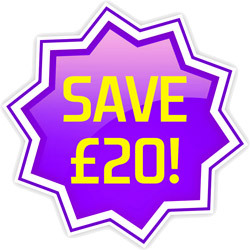 Instead of a £10 discount, customers get £20 discount (almost the price of a 1 hour lesson!). Now customers are much more likely to take advantage of the £20 saving. In really restricted weeks (such as the week between Christmas and New Year), it may be an idea to book slots well in advance. Not all of us like working these days, I didn’t as a full day of lessons soon became a day with a lesson in the morning and one in the afternoon after the cancellations had come in (family party/ill/hungover, etc). The next year I decided to ‘sell’ these slots on a first-come-first-served basis. I would have slots available for each day I worked and if my learners wanted a lesson between Christmas and New Year, they would pay for it in advance to secure the slot. Do keep the money separate though! If you can’t do the lesson for whatever reason (e.g. adverse weather or illness), they have still paid for a lesson and you don’t want to work the first week in January knowing you’ve already spent the money for those rescheduled lessons! I think most ADIs use appointment cards, but there are still some that don’t. Yes, the pupil forgets to bring it sometimes, or they lose it. Simple answer for that – give them a new one. Just one lost lesson at £24 will pay for a bulk purchase of around 1,000 cards, so it really is worth the investment! Use one side of the appointment card to outline your terms and conditions – this way your pupil always has them to hand when they’re thinking of calling to reschedule their lesson. 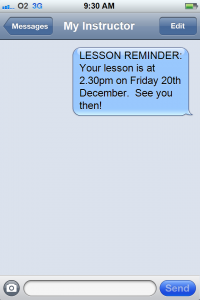 SMS reminders or emails can be sent out to your pupils, manually or automatically, to remind them of their lesson time and date. A message can be sent out a couple of days in advance of their lesson so that they remember when their lesson is booked for. Results for this strategy can vary. When we had these for our driving school customers, some instructors said they reduced cancellations and some said they had more last minute cancellations. We’d be interested to hear what your experience has been if you use reminder texts or emails. What other strategies do you use to minimise cancellations and loss of income? Was has worked well and what hasn’t worked so well? We’d love to hear your stories so that others can benefit from them too. Finally, if you liked this article, about how to Reduce Driving Lesson Cancellations please share it on Facebook and Twitter – simply hit one of the social media buttons below. Thanks! I tend to let them away with it on first offence but it comes with a stern warning/reminder if it happens again, that FULL fee will be charged, and it does! But some still try their luck after this point… I try to make them understand that other pupils could have used that wasted slot to gain extra practise time with me, ie their happy and IM happy because I make a living. But the circle of repeat offenders returns every 2-3weeks, especially around Xmas,Halloween, Bank Holidays etc. Q. HOW THE HELL DO YOU MAKE THEM UNDERSTAND YOUR TRYING TO RUN A BUSINESS AND NOT A CHARITY. I use an iphone app called Textopus. Basically I have templates set up as reminder texts for all the regular lesson slots I use, when I get in each night, I simply select which pupil is in which slot for the next day, and it sends the messages, takes approximately 2 minutes. I get great feedback from my pupils about it, and have never (albeit in my limited experience) had a cancellation after a reminder text. Thanks for the tip Martin. I have Textopus on my iPhone but didn’t think of using it this way. I have now set it up for my regular slots (which is most of them). Good information – I have always used terms and conditions and I send them out with my lesson confirmation letter, this ensures that I receive the tc’s. signed when I pick them up for their first lesson. You are right about being honest and up front, I have the main points printed in red ink so it stands out and I always discuss the importance of prior notice for cancellations. I also inform them that if I ever let them down (very rare) they will receive a free lesson next time. I get paid for cancellations and if not I would not rebook them because they do not respect my time. Am now going to highlight in red! Thanks Dot. Totally agree with your post. Be positive. Cancellations allow the ADI to clean the car, buy food, do housework, catch up on TV, or have a lie in (if the first lesson of the day is cancelled). Accept cancellations as a part of your work and don’t stress about them. “No shows” are the problem, and reminder texts sent the night before replace the (bad) no shows with (better) cancellations. My reminder text is the day before and says there may be a charge if you do not attend- with a 48 hr cancelation policy they hardly ever cancel!! I have introduced a system of 8hrs to be completed over a one month period. The pupils book all their lessons for the month, same day and time each week – those who do shift work always let me know their days in plenty of time – then, if they need to cancel last minute, there’s no charge because they then have to find another day during the month to fit the lesson in. Once the month is up then there are no more lessons available so that will be when they lose if they haven’t managed to re-book. Only exception is for the last week of the month, I then allow them to carry that lesson forward to the next month, making 10hrs they have to fit in. It has worked a dream for me (my t’s & c’s are very clear) and pupils always send me a list of alternative dates if they have to cancel. This way I get the best of both worlds – some extra free time to use and no loss of income! It works for me as I don’t work flat out full time, I don’t think an instructor working 30+hrs every week would find this system quite so easy. By-the-way, each person’s month starts on the most suitable date for them, such as pay day. Parents sign my T&C’s on behalf of their 17year olds and as they are usually the ones paying for the tuition, they at least understand the implications of late cancellations. This has made life a lot easier for me over the years! The customers can book their own sessions, and Apptoto send an email and text reminder. I can see at a glance if they have confirmed the appointment, and it tends to keep both them and me on the ball! Good advice, I use apptoto and Youcanbookme but I still get late cancelations. I have just had one this morning cancel her lesson for tomorrow as she has a Panio lesson!!! I suggested she cancels her Panio lesson but she declined this as it was important to her collage/uni work. I haven’t charged her but as this is the second time she has done this I will remind her of my T&C and if she does it again she will be looking for another instructor. As an instructor can only take on so many clients at any one time, ie if you want to work 30 hours per week and say for ease of explanation all clients want one hour per week, the instructor can take on 30 clients at any one time, and you are relying on these same clients for your income until they pass their test. If you have a cancellation policy of say 48 hours notice and six clients that week cancel and give you 48 hours notice, you are down to 24 hours work with no way of making up the hours. You cant take on a six new learners as the original six will want their lesson slots back the next week and the six new clients will not be happy about you dumping them after one lesson (that’s if you are lucky enough to have six new enquiries at the same time) Driving instructors are in effect on zero contract hours, how many people on zero contract hours do you know who can afford to buy a brand new car as in our job not knowing if they have enough work to pay for it each week! The client cancelling I’m sure would not be happy if their boss consistently cancelled their work on a weekly basis (often by text) and be told sorry but I’m not paying you either! Therefore my cancellation policy is any lesson booked up to seven days in advance is payable at time of booking and is non refundable as I have to be guaranteed at least one weeks income in advance (not much too ask) They can cancel any lessons booked after this seven days with no penalty. All my clients are completely understanding and accept these conditions. As for me cancelling a lesson (Almost unheard of) the law states I pay compensation if the client has lost out financially due to me cancelling a lesson. For example if the client took an hour off work and lost an hours pay due to my cancelling, I compensate the client one hours pay. Everyone seems to forget that if the client cancels a lesson, the instructor loses out financially, if the instructor cancels, the instructor is still the one who loses out financially not the client, so therefore why do instructors feel the need to compensate a client for something they haven’t lost, they will re-book the cancelled lesson and have lost nothing, the instructor is always the one financially out of pocket. If I cancel a days lessons, am I really expected to give all of those clients a free lesson therefore losing two days pay, and using fuel in the process which I am not getting paid for, after all does my hairdresser give me a free hair cut and colour worth £59 if she cancels my appointment??? I don’t think so! Thanks for sharing your thoughts 🙂 I definitely think more instructors should adopt the policy of taking payments at least 7 days in advance. This is exactly how we run our business, too. As a result of doing this, our cancellation rate has dropped to almost zero. Works great, doesn’t it?! To us, customer service is the key to our success – we don’t feel our time should be considered to be any less valuable than our clients’. I believe consumer rights are the absolute minimum level of customer service we should aim for. Amazing businesses have amazing customer policies. Take the likes of Costco, Amazon and Premier Inn, for example, with their returns (or ‘Good Night Guarantee’) policies. They know the level of consumer rights they need to offer. But they go over and above, which is why they are so successful. An item breaks 3 years after you bought it from Costco? Take it back and they give you the full purchase price back in cash – no questions asked. Buy something from Amazon and then change your mind? Send it back for free and get a full refund. Didn’t have a good night’s sleep at Premier Inn? Then have your money back – no questions asked. All of these actions leave the companies ‘out-of-pocket’. I know these are multi-million (billion?) pound corporations, but even local companies can (and do) offer similar levels of customer service. A local (high end) wine shop, for example, gives you a full refund if you are not satisfied with one of their wines. Unhappy with a meal which is served in our local pub? They knock the cost of it off the bill. Like you, thankfully we rarely need to cancel sessions at last minute. But mistakes do happen. For example, twice in the last 13 years, Claire and I have turned up at the driver training office to conduct ADI training sessions and one extra trainee has turned up, when it has been our fault. We look through training records and communication to check who has made the mistake. We found that we accidentally wrote the wrong date or time on their last training record. So now we have a situation to deal with. Both times, we have dealt with it exactly the same way – profusely apologised for our error and explained that their next session will be given free of charge. We lose £180 income when we do that. Thankfully we have only ever had to do this twice. We could, of course, have offered to give them petrol money for the inconvenience, but we prefer to massively exceed their expectations and to leave them with a smile on their face. Offering a cancellation policy that penalises the student when they make a mistake is fine. But it makes agreeing (and sticking) to that policy much easier for the client if they can see that the policy is fair. You cancel on me, you compensate me. I cancel on you, I compensate you. Fair’s fair. Just our thoughts. Thanks for reading and posting your comments! I have in the past compensated a client with a free lesson here and there when it has been on rare occasions my mistake in booking an appointment, I will hold my hands up when I am at fault yes! But I do find this industry seems to be different to every other industry. As I mentioned before for example, if my hairdresser cancels on the day because she is ill, am I really expecting her to give me and everyone else their appointment for free? or discounted price next time? as you’ve said fairs fair, but this would cost her dearly in monetary terms, and I would never expect her to compensate me as this would be financially unfair to her, and she would probably likely always be “Too fully booked” to ever fit me in again if I demanded a freebie or a discount!. One evening of my college course was cancelled due to the teacher not being available, no financial compensation was offered, the course ran for one extra week, we got our course! My dentist failed to cancel my appointment with me recently and I travelled to the next town for my appointment as booked only to be told they hadn’t realised they had failed to cancel my appointment. This is a private dentist, but whether it was private or NHS I was not offered my re-booking for free or offered any discount on my next booking or petrol money I had wasted and it didn’t occur to me to even ask! I re-booked had my treatment, no problems. I know you’re not, Lindie 🙂 You sound very conscientious and I think your proposal would be a fair one, yes!